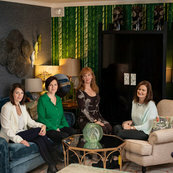 This was our first experience of working with a professional interior designer and it was a joy ! We were delighted to help you take your house to the next level, as we all know a family home is constantly evolving, thank you for your kind review and we look forward to seeing you again soon. Mary thank you so much, I really enjoyed working with you, enjoy your gorgeous sitting room! Thank you Lorraine! You have a fabulous colourful home that really suits you and your family, thanks to your trust, a pleasure! Lovely lady to work with, great ideas and style suggestions. Colour suggested worked really well and the wall paper I loved when I saw it first time.